1 NM-PP1 is a cell-permeable PP1 analog that acts as a potent and selective inhibitor of mutant kinases over their wild-type progenitors. 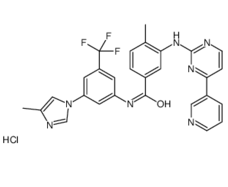 AP23464 is a potent adenosine 5'-triphosphate (ATP)-based inhibitor of Src and Abl kinases, displays antiproliferative activity against a human CML cell line and Bcr-Abl-transduced Ba/F3 cells (IC(50) = 14 nM. AP23464 ablates Bcr-Abl tyrosine phosphorylation, blocks cell cycle progression, and promotes apoptosis of Bcr-Abl-expressing cells. AP23848 is a potent Bcr-Abl inhibitor. BGG463 can inhibit c-ABL-T334I, BCR-ABL and BCR-ABL-T315I variants with a 50% inhibitory concentration (IC50) of 0.25 μM, 0.09 μM and 0.590 μM, respectively. 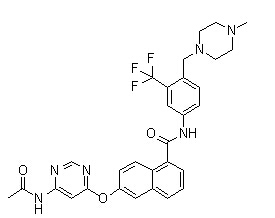 Radotinib, also known as IY-5511, is an orally available, a second-generation tyrosine kinase inhibitor of Bcr-Abl fusion protein and the platelet-derived growth factor receptor (PDGFR), with potential antineoplastic activity. BCR-ABL-IN-2 is an inhibitor of BCR-ABL1 tyrosine kinase, with IC50s of 57 nM, 773 nm for ABL1native and ABL1T315I, respectively.